Four Week Sessions. Mondays 4-5 pm. This 4 week session is for tween/teen students interested in aerial arts. This class is for ages 10-15, all levels and abilities are welcomed. 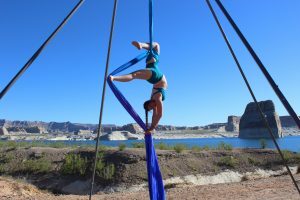 Students will begin learning fundamental postures of aerial silks; including climbs, locks, holds, and transitions, to safely build a strong foundation in aerial arts. Each class will include strength and flexibility exercises specific to aerial training.